It’s a small, daily dab towards living more beautifully, mingled with aesthetics and olfaction. One of our favorite parts of meeting makers of all kinds is getting to ask a complete stranger, “tell me the story of your life.” Everyone of them excites us, teaches us, and moves us to a new level of understanding our own story. While our role in these interviews borders on scientific observation, they are routinely, unpredictably dynamic. We leave them feeling more connected to the world, the person, and the mission each represents. At the very least we’re inspired; at best, infected with hope. Kathleen Currie’s story lives beyond a product and a business model. Conceiving and cultivating a brand is hard work for anyone, and might be thought of as impossible with two other concurrent rent-paying day jobs. Improbable as it was, Kathleen’s line of essential oil perfumes began as a few faithful drops on a mixing palette, and coalesced into an artisan adventure. This is the story of Smoke and one woman’s vaporous path to finding what she was made to make. In place of hyper-feminine florals and macho musks, her scents offer a third way. We first meet Kathleen at Pagoda Café, just a short sashay from her studio. We pepper her with questions about the origins of Smoke, the name, the packaging.. more on that later. After coffee, the three of us glide over to her studio in the lower portion of a friend’s home. We duck into the dim, cavern-like space effusing the deep, rich scent we have freshly become familiar with. Piles of neatly twine-tied white boxes obscure the floor, and pieces of pristinely laser etched wood line the walls, masking the insulation peeking through. It’s perfect. The packages responsible for the cramped footspace are gift boxes, destined to fulfill the holiday rush Kathleen anticipates. 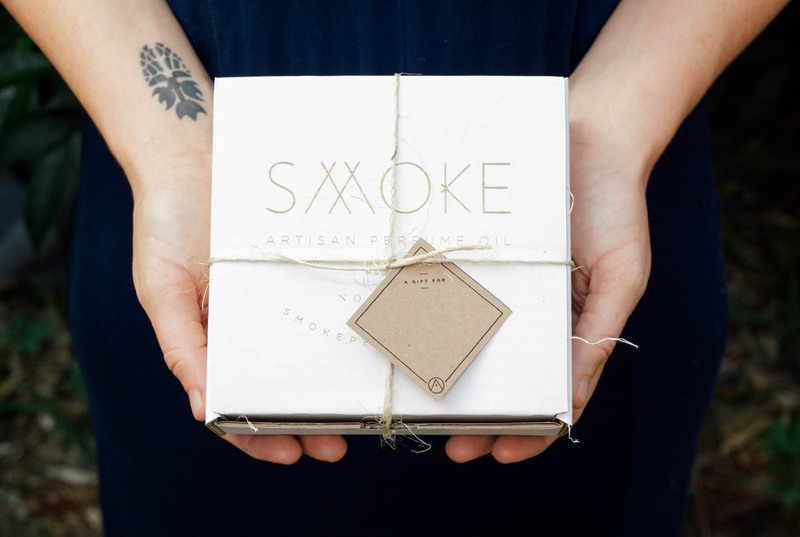 We peek inside these soon-to-be-given boxes to find the kind of care in packaging we’ve already come to expect from Smoke. Each tiny sample cozies itself atop golden curls of wood wool. A tiny box of matches glints with the phrase, “create solace in scent,” reminding the lucky one pulling back the twine that this is no typical perfume experience. A miniature stick of palo santo incense wood is included. “The world of handmade perfume can get really cheesy really quickly,” she informs us, alluding to the majority that rely on stereotypes she hopes Smoke will snuff out. In place of hyper-feminine florals and macho musks, her scents offer a third way. The packaging makes it clear before you even catch a whiff. There were so many things about Smoke we wanted to know. True to the name it bears, it’s kind of a mysterious brand. Honest, but with a touch of mysticism. 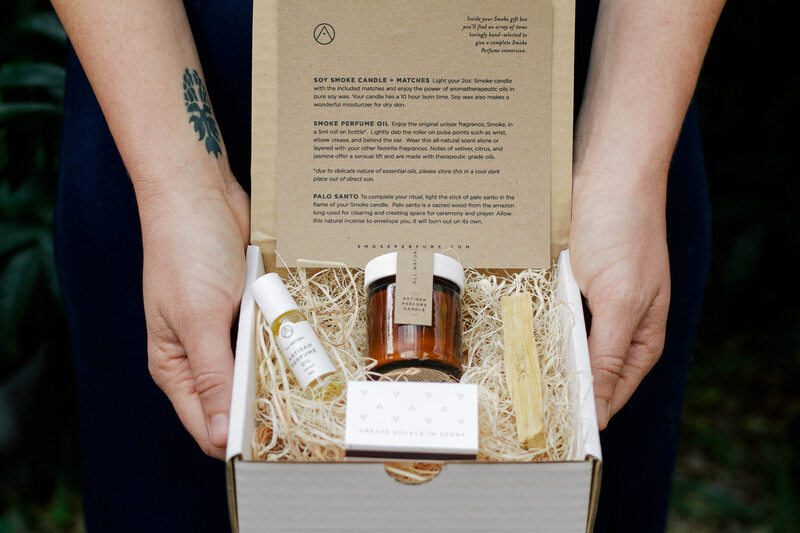 Because we admire her packaging and brand so much, we began with questions about how she chose such a sustainable, natural look for her scent. We assumed she has a background in design of some sort. “Oh, no. I have a designer,” she explained, and added that finding the right team of specialized input made all the difference for Smoke. 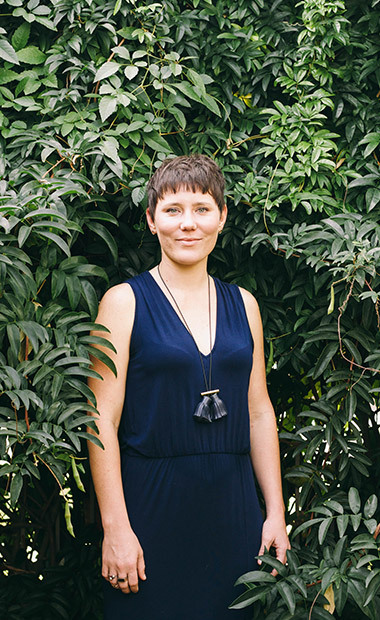 “It was amazingly challenging to find the right designer. And researching. I spent hours and hours online learning like, ‘what do I want?’” Which may seem like an odd question. If you are starting your own business, wouldn’t you already know exactly what you want? I’m beginning to think that only the severely (bless them) inexperienced know exactly what they want. For most, it takes time, energy, and limitless editing to discover. Honestly, all those setbacks were validating. They helped me realize how much I actually cared about Smoke. But in a big way, she has figured that out now. 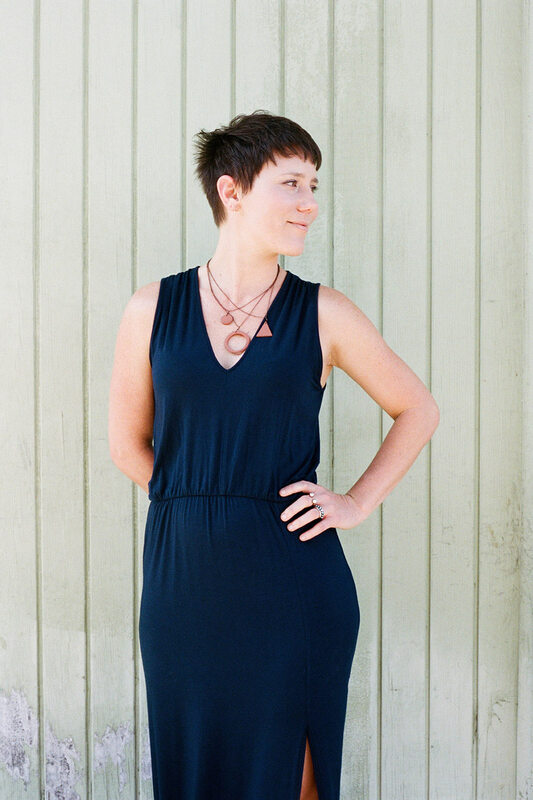 When she began in 2009, Kathleen was experimenting with essential oils for a slightly more than part-time role as a massage therapist. She had always used a generous amount of natural oils in her work, concocting spontaneous blends for customers, but was becoming increasingly experimental. “I had just moved into the French Quarter and there was a lot of transition happening for me, and I found that the oils were comforting. It was something I could do before I went out. I could create this blend, and dab it on before I went out for the evening.” She referred to it then as a type of “invisible cloak,” a positive shroud that went with her everywhere. Then came the compliments. In it’s early, unnamed days, friends were so enamored with the scent that Kathleen started dispersing petite 5 ml sample vials to people she knew. But it wasn’t just friends who loved it. 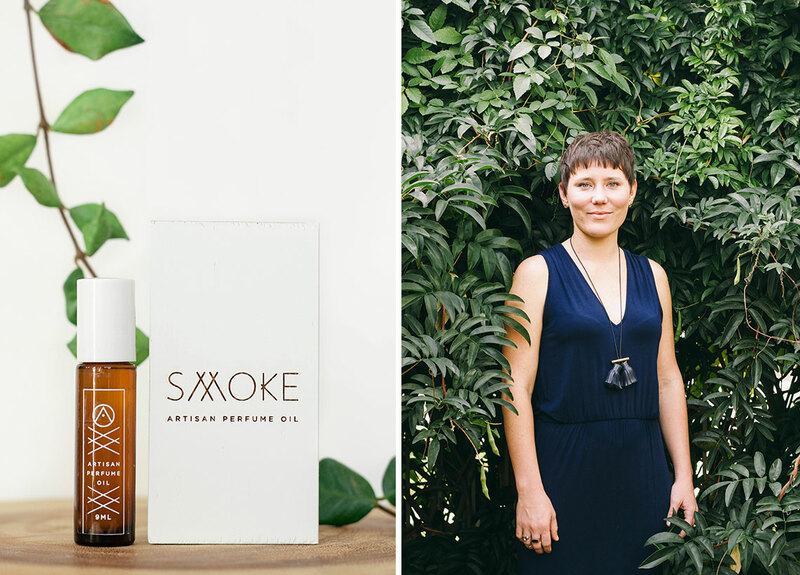 “My brother is very entrepreneurial, and he [said], ‘that smells amazing, I can’t stop thinking about it, we should launch a perfume company!’ Coming from a family of entrepreneurs and business people, the two named Smoke together and started replicating the blend she created. But sometimes, life happens. She confesses that for a long time she was hot and cold with Smoke, investing more heavily massage therapy at times, her part time gig in business management at others. After years of vacillating, she went full speed ahead in 2012, and for awhile, forgot to worry about whether or not Smoke was worth it. Stockists came calling, and so did New York Magazine only two weeks after the original scent launched. Instant fame – who could ask for more affirmation? There were other promises for big orders or fancy magazine features. But slowly, most of them began to fall through, just out of circumstance, outside of her control. There were disappointments; big breaks that ended up broken. I wouldn't be sure that Smoke was a good business, but I would get home and make a batch of it, and smell it and remember why I'm doing it. Being patient with her own growth has truly paid off. Her stockists span 16 states, not to mention one international store and several online accounts. Growing on a national level has created a different set of struggles for Kathleen. As a small business owner, you can’t be too careful to protect yourself from equating self-worth with the brand’s popularity. 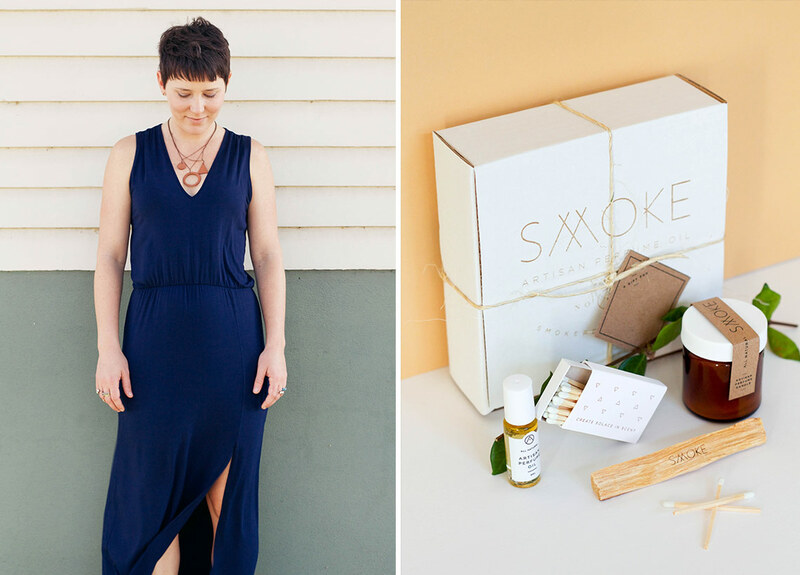 “I wouldn’t be sure that Smoke was a good business, but I would get home and like make a batch of it, and smell it and remember why I’m doing it.” When Smoke faced lessons in vulnerability, Kathleen would settle back and consider them opportunities to grow and focus the voice of brand. She wanted to create something to be proud of, something to stand out in the world of perfume. Because it is a higher ratio of essential oils to alcohol, even more so that other natural perfumes, it has a therapeutic quality. From her background in aromatherapy, she uses a vetiver base in Smoke, adding notes of jasmine, and citrus to uplift the wearer. For Ritual, her most recent scent, she incorporates clearing oils like cinnamon, neroli, and Turkish rose. In each, she wanted a natural, uplifting, unisex product that would be beneficial and beautiful to whomever wore it. We asked what her advice would be to others starting out who will inevitably meet with the same struggles. Her wisdom is to just keep moving forward, and focus on getting to the right idea. “If it’s the right idea, and you stay involved with why you’re doing it to begin with, I think the rest will just sort of happen. There is a lot of fight you have to bring to the table.” The fight that Kathleen has continuously brought to her work imbues a certain strength in the brand that’s hard to put to words. You detect it with another sense, one that mingles with aesthetics and olfaction. It’s beautiful, enduring, positive, sustainable, and – for new perfume wearers like myself – it’s just fun. It’s a small, daily dab towards living more beautifully, and recognizing how worthwhile that truly is. Try this deep, rich scent in any of it’s forms to support Kathleen and local makership in New Orleans. Great article about a wonderful woman who happens to make my favorite scented products!